Are you ready to hand over some of the laundry responsibilities to your child? 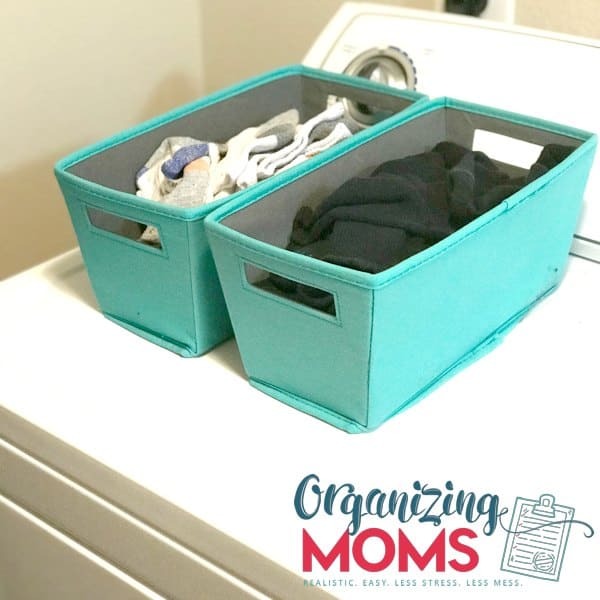 Even if your child isn’t ready to start operating the washer and dryer, s/he can start learning how to organize clothes. To start out, you need an easy-to-use and access system that your child can easily understand. 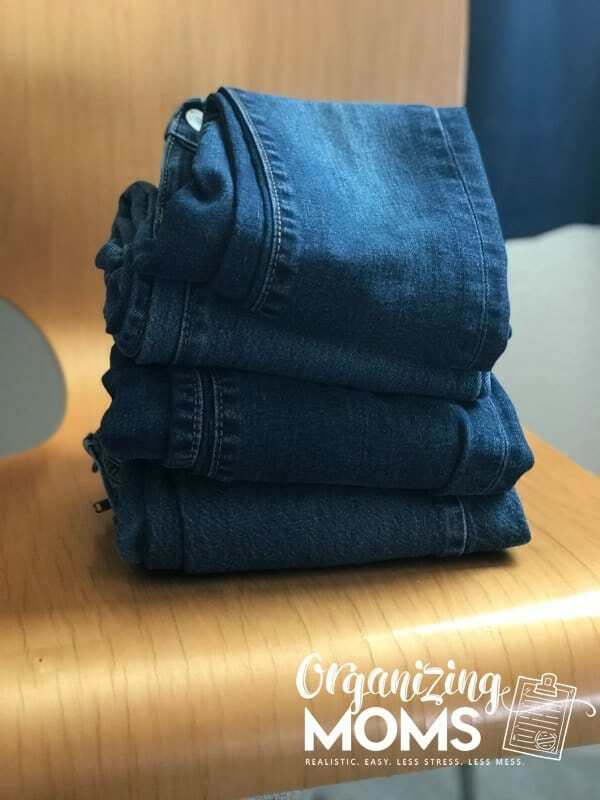 Our kids have closets and dressers in their rooms, but when they first started helping me put clothes away, they had trouble putting clothes away in drawers without accidentally unfolding them in the process. And they definitely had a tough time with hanging clothes. 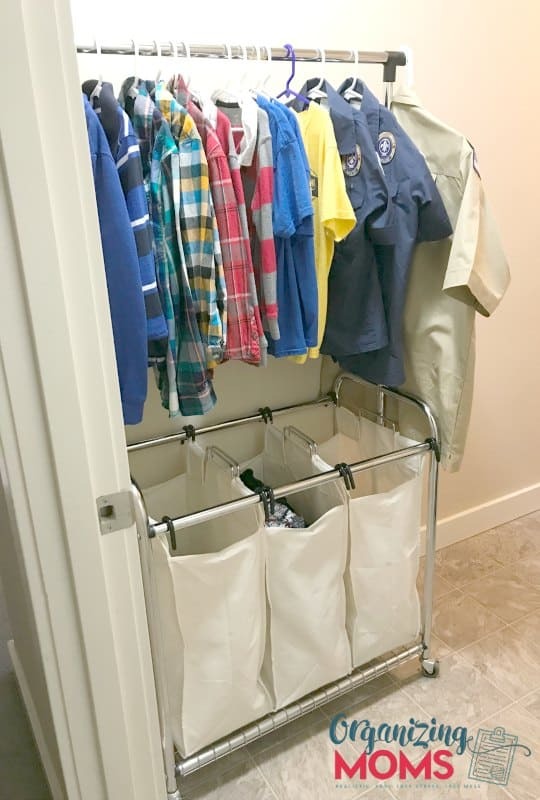 To minimize everyone’s frustration, we invested in a hanging clothes organizer that had 5 compartments – one for each day of the school week (you could get a different size if you wanted!). We also put small bins in their drawers to contain undergarments. 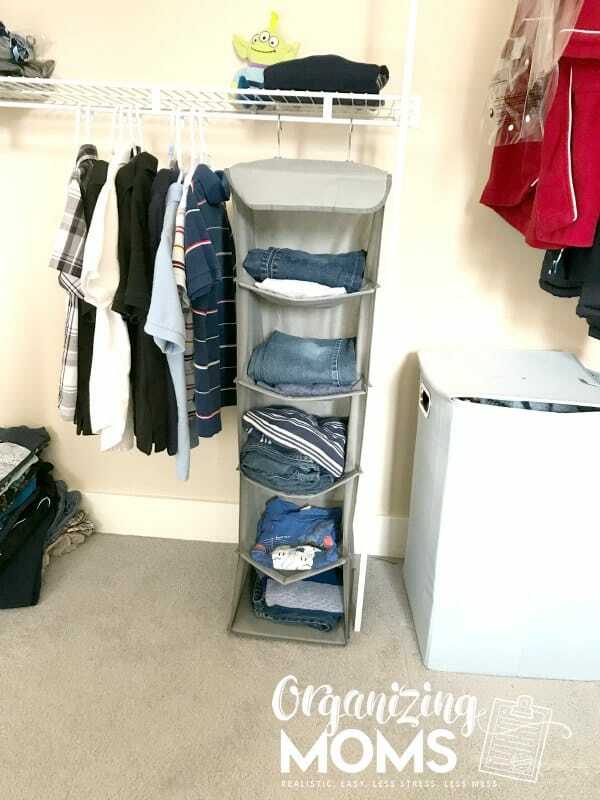 In each cubby of the hanging clothes organizer, we store one shirt, and one pair of jeans or shorts. That’s it. We have boys, and wearing blue jeans every day is pretty much the norm for them. If you have girls who wear different types of bottoms, this will still work, but you might want to put whole outfits together before having your child put them away so you can make sure they’re not missing an essential part of an outfit. When we started having our kids put their own clothes away, we started small. I put them in charge of putting one type of garment away at a time. Because their organizers only house jeans and shirts for school days, we started with that. I’d give them a stack of folded blue jeans, and have them put one pair in each cubby. I worked with them the first few times they did it, and gave them lots of praise for a job well done. After a while, I backed off and let them put away the jeans by themselves. I still made sure to praise them for doing such good work putting their things away. Next, I gave them a small stack of shirts to put away. Again, they had to put one in each cubby, even if there were already jeans in the cubby. Sometimes, if a miracle happened and I was actually ahead on laundry, we’d have some extra shirts. The boys knew to keep them on the floor right by their organizer. 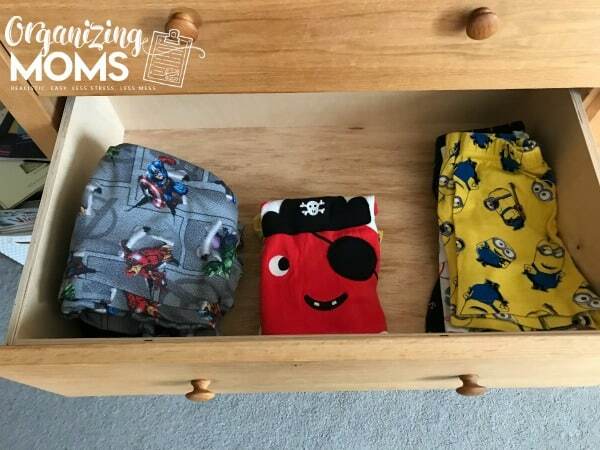 Pajamas – These all go in one drawer per child. If things get unfolded or messed up, it’s not a big deal. They’re all contained in one drawer and we all know where to find them – even if they’re wrinkled. Undergarments – In a box or bin in a drawer for each child. We just throw them in there – no folding required. 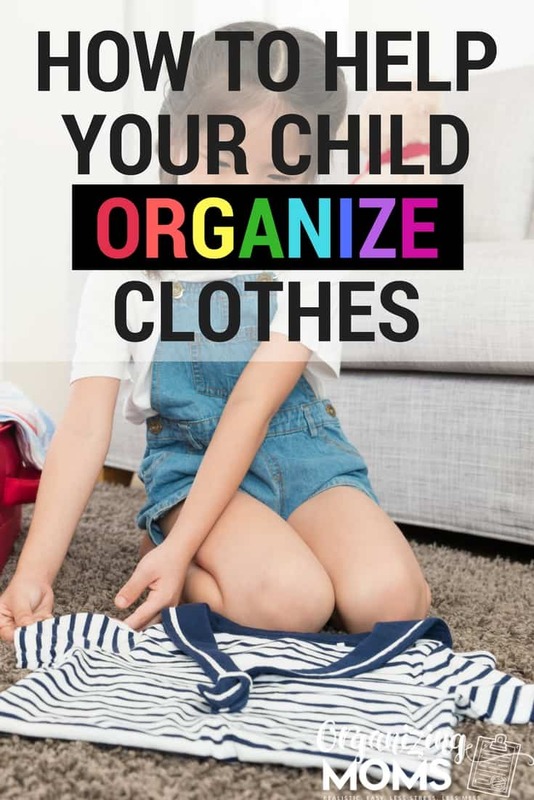 This is another easy thing to start with if you’re just teaching your kids to put away their own clothes. Socks – I quit folding and putting away socks years ago. I bought one type of black sock, and one type of white sock for the kids, and I keep the clean socks in two small bins on top of our dryer. When I pull them out of the dryer, they go directly into the bins. When the kids need socks, they go into the laundry room and take what they need. My kids are twins and they wear the same size in socks, so this works well for us. It might not work so well if you have a lot of different sizes to work with. Sweatpants, play clothes, etc. – Each child has one drawer for sweatpants. We have some play clothes that the kids probably shouldn’t wear to school, so I keep those tucked away higher up in their closets. Otherwise, they might get chosen as a school outfit. When we’re going to be playing outside and getting dirty, I find the play clothes for them. Not a great solution, but we don’t have to do it often. Fancy clothes – The kids have two or three outfits that they wear to church or for special occasions. I keep a lot of these clothes hanging in our laundry room, even though they do have space in their closets. This way, I can see exactly what “fancy clothes” we have clean, and set out their outfits for them ahead of time. We’ll definitely change this when they’re older, but for now it works. Uniforms – I also keep these in the laundry room so I can see that they’re clean. Plus, if I need to add a patch to a scout uniform while the kids are sleeping, I don’t have to sneak into their room to find it. Extra t-shirts/out-of-season items – We keep a lot of these folded up on the closet floor. Where we live, we occasionally have warm weather, so we don’t put all of our summer clothes away. The kids also like to wear warmer weather clothes when they’re just hanging around at home on the weekends. 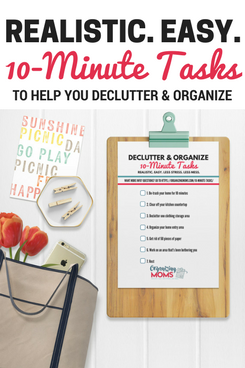 I hope this gave you some good ideas for how to help your child organize clothes. 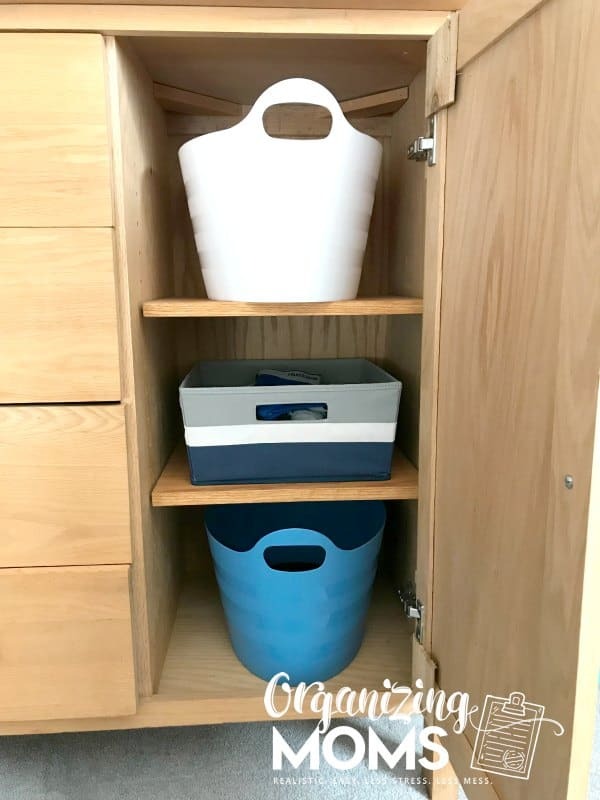 Unless you also have twin boys who wear a lot of jeans to school, you’ll probably need to tweak this system to fit your family and the layout of your house and laundry area. 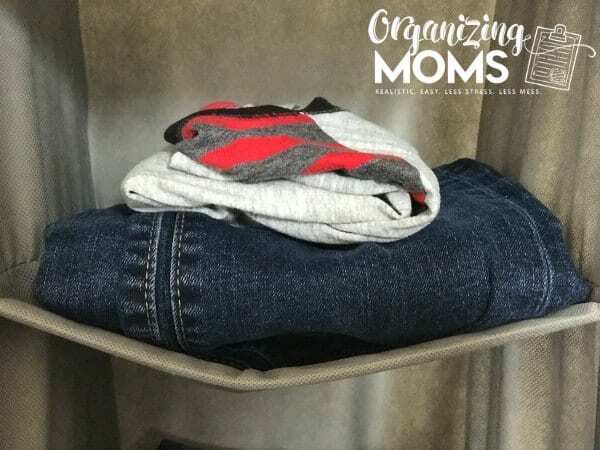 As long as you make it easy for kiddos to put things away, and work with them to learn the system, they can help organize their own clothes. It may take some time investment up front to teach them the system, but once they know it, it will save you a ton of time! WANT TO REMEMBER THIS? SAVE HOW TO HELP YOUR CHILD ORGANIZE CLOTHES TO YOUR FAVORITE PINTEREST BOARD.